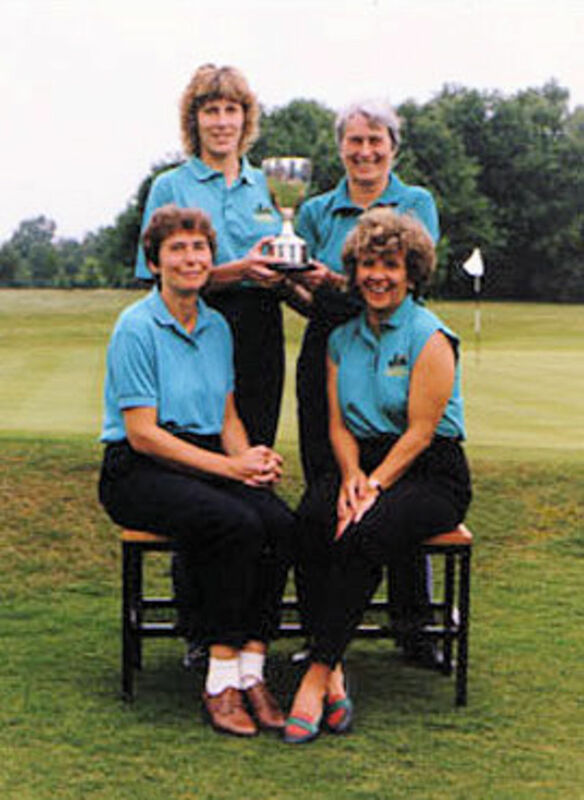 In 1995 Holtye Ladies took part in the County-organised event called the Kathleen Rider Foursomes. The format of this competition is two pairs playing Stableford Foursomes and the scores of the two teams are added together to determine the winners. The course chosen by the County for the event was Highwoods Golf Club which proved to be a real test, not only for its length, but also for the tricky, brisk wind evident on the day. Sharon Hinton, our 1st Team Captain for the season, chose herself to play with Hilda Quinn and Di Botham to play with the Lady Vice-Captain of that year, Glenda Ricketts. The difficulty of the course and the conditions on the day produced poor scoring generally, but Holtye amassed 62 points and were in the lead in the clubhouse for what seemed an eternity. Many of the "big clubs" were still out there competing and expected to do well. After a four hour wait, no other team could match or beat the Holtye combined score. Di and Glenda finished with the highest score of the day for any pair. Needless to say there was much jubilation and incredulity amongst the Holtye supporters, but it proved to be a moment never to be forgotten in the annals of the Holtye Ladies section.